My 2.5-hour flight from Istanbul departs at 2 am and I assumed that the meal offerings would be limited but it’s quite the opposite. Out comes the crisp linen cloth, and so begins the inflight meal service. Meal choices include Beef Wellington pie, Pancakes with duck meat filling or Paccheri pasta. I decide on the Paccheri pasta which is stuffed with salmon pieces and dressed in a delicious cheese sauce. Complementing the main meal is the appetiser of roasted pork loin served with fried chickpeas, mushrooms and sweet pepper, baked bread and fresh fruits. To finish, I opt for the English breakfast tea which is served with a petit four dessert. The 3.5-hour flight from Moscow to London departed just after 9 am and I was offered a myriad of choices for lunch. These included options such as: Rabbit Patty with tempura vegetables, Roasted duck breast with baked apple and plum slices with vegetable pilaf or Catfish patty served with cuttlefish ink pasta and creamy sauce. I settled for The Rabbit Patty. The tempura vegetables are crisp, and the rabbit patty is an exciting mix of flavours. 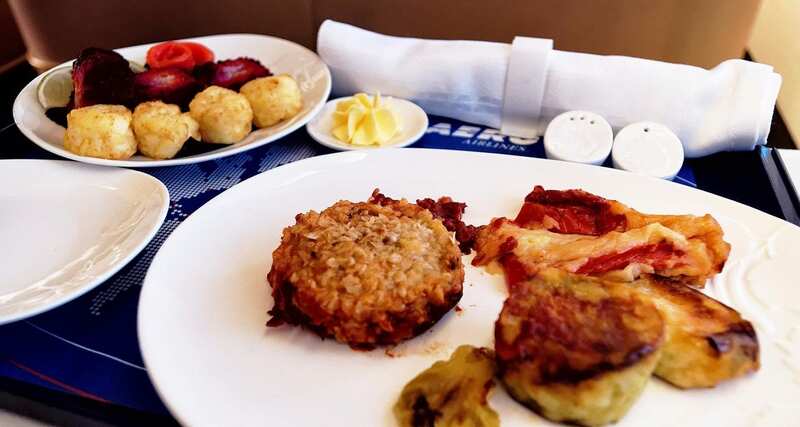 After my flight I find out that Business and First class meals on Transaero are not prepared the usual way, the airline works with Dellos Air Services in the centre of Moscow. Dellos is an upmarket caterer and makes all business and first class meals in the centre of Moscow which are then delivered by special refrigerated cars that meet each aircraft. The result is a truly quality and fresh inflight meal product for passengers who travel in business and first class with the airline. In summer, dishes are lighter and by autumn/winter dishes gain extra calories to compensate for the lack of warmth and sunlight.